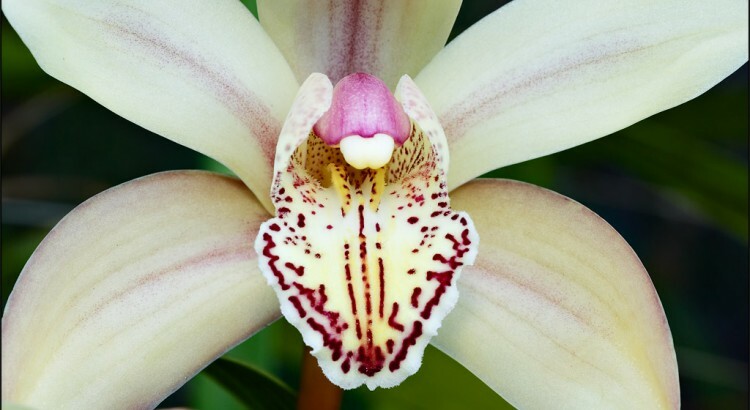 Aside from being spectacularly beautiful, Cymbidium orchids are a fantastic plant as they require very little from you when they are not in flower. That makes them a great house plant, and an even better gift. 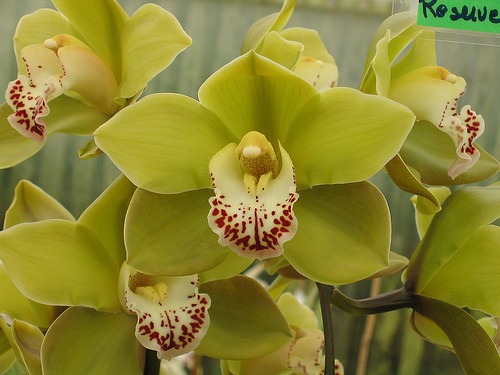 The Cymbidium orchid is sometimes known as the Boat Orchid, and has 52 evergreen species. They generally live in tropical and subtropical regions of Northern Australia, as well as Asia, Borneo, the Phillipines, Malaysia, Northern India, and Japan. The climate in most Australian capital cities is suited to growing cymbidium orchids in a sheltered, shady area. This differs from many of the more tender tropical species of orchids such as the slipper orchids (Paphiopedilum) and moth orchids (Phalaenopsis), which need warmer/humid climates or hot house conditions outside the tropics. Their blooms have a diameter between 5 and 10cm, and generally bud and bloom throughout the winter months from May, through til September. Each flower spike can have 15 or more flowers, and are available in a variety of shades including; white, cream, green, yellow, brown, pink, red, orange and even black. 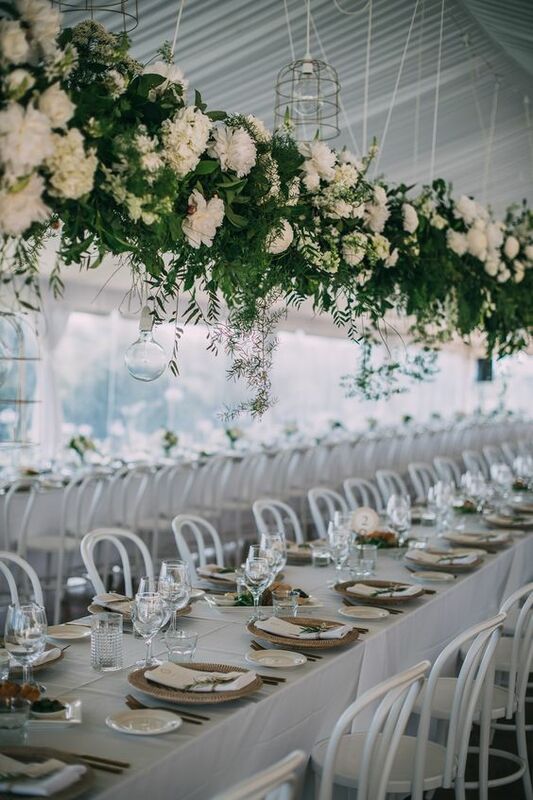 Flowers are incredibly long lasting, so whilst they can seem a tad expensive per piece, they do provide great value for money, with them lasting up to ten weeks. 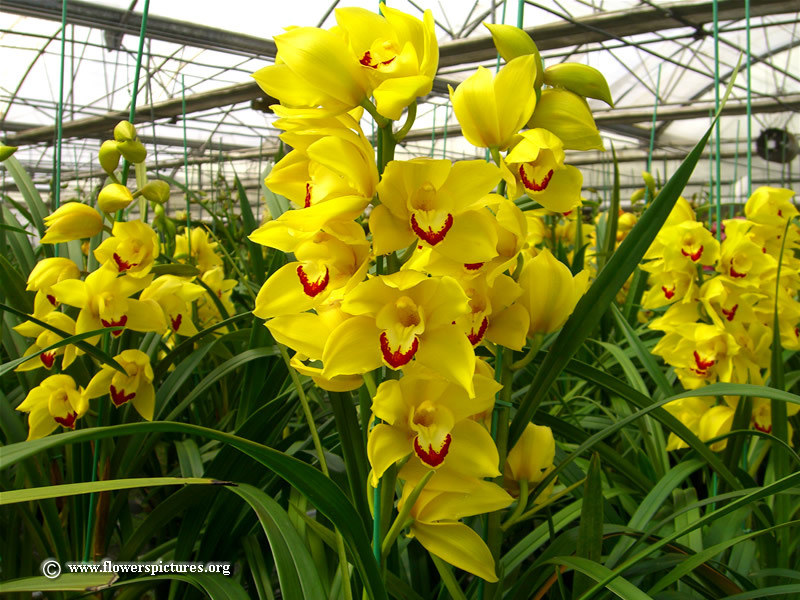 Some orchids produce up to four flower spikes from each bulb and have erect, fleshy leaves, and once they are in flower the plants can be brought indoors into a bright room where the blooms can be enjoyed for many weeks. 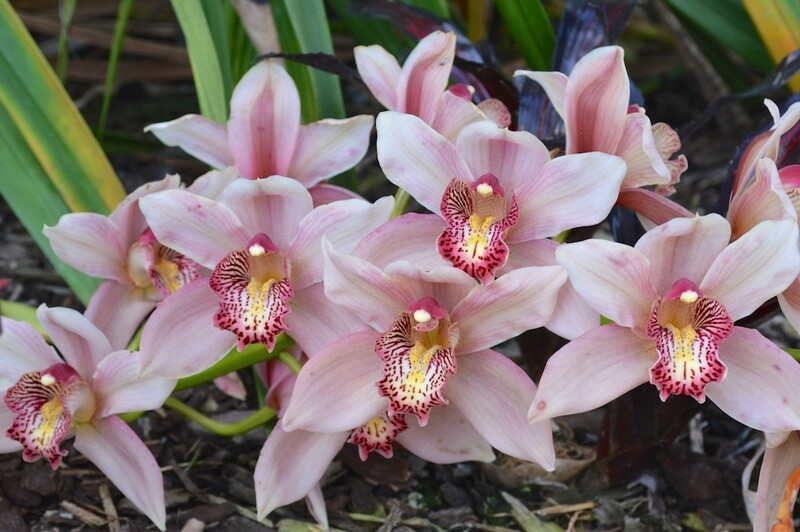 Some varieties of Cymbidium orchids are fragrant, (some of my favourites) and often these are cultivated varieties from China. Cymbidium orchids are what some believe to be one of the easiest orchids to grow but sometimes they need a little encouragement to flower. I was always told in my floristry training, that Cymbidiums are best being neglected throughout the year until flowering time came, perhaps sitting them under the canopy of other plants to provide some shelter. This is somewhat true as Cymbidiums do not want hot harsh sun to burn their leaves, but rather filtered light throughout the day. Light is in fact the most important factor to getting your orchids to reflower; too little sunlight will reduce flowering. 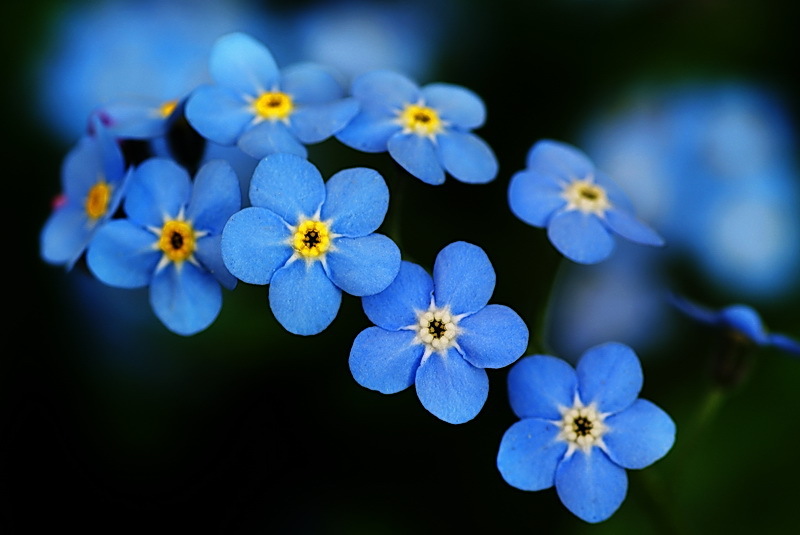 Once the plant has ceased flowering, you should begin your fertilising program. Ideally use something like Dynamic Lifter pellets, and simply feed your plant with a light sprinkling approximately every 6 weeks. 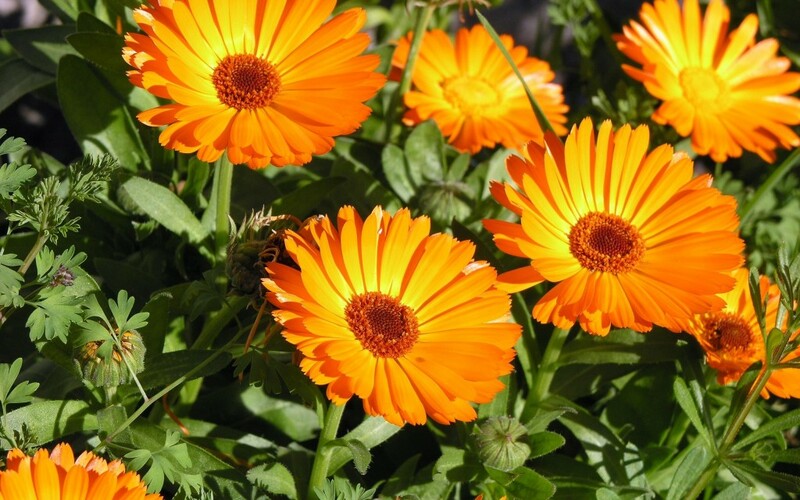 In the summer months you should switch to a flower promoter, and apply every fortnight. 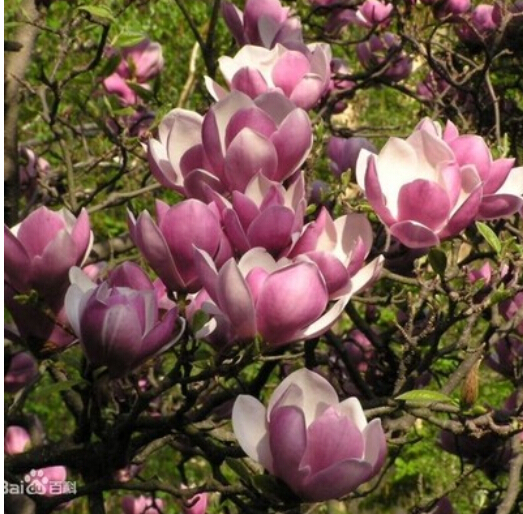 You can also divide your plant throughout spring, so that the plant is not over crowded. Be careful not to split the plant into too many small sections as it takes longer for smaller clumps to reflower. Keep an eye on your plants foliage. Ideally your Cymbidium should have a light apple green foliage. And whilst lush dark green foliage may look attractive, it is usually a sign that the plant is getting to much shade. Avoid positions where the plant will be ravanged by the elements, battered in strong winds or being in very exposed positions. 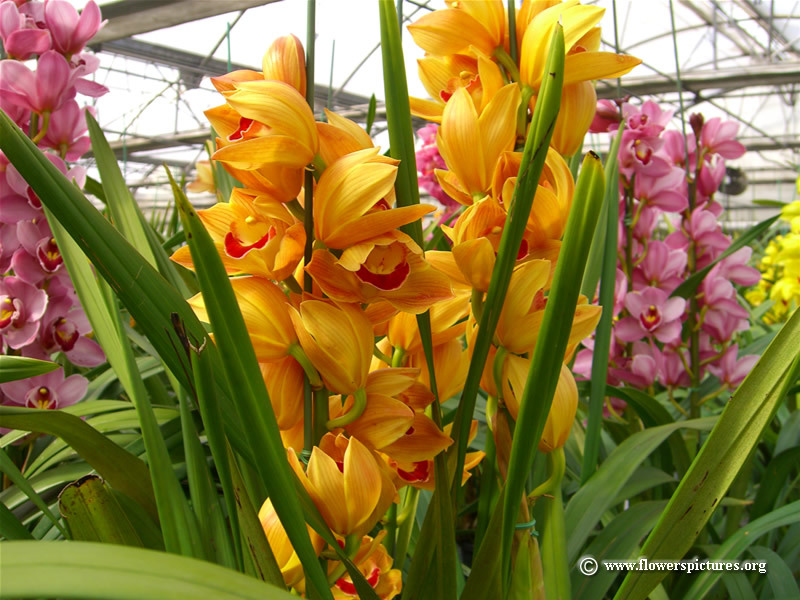 Cymbidiums hate having wet or cold roots, so whilst the plant is in flower (throughout the winter months) you should reduce your watering. Poke a pencil into the pot and if the pencil appears damp when you remove it, the plant does not require watering. 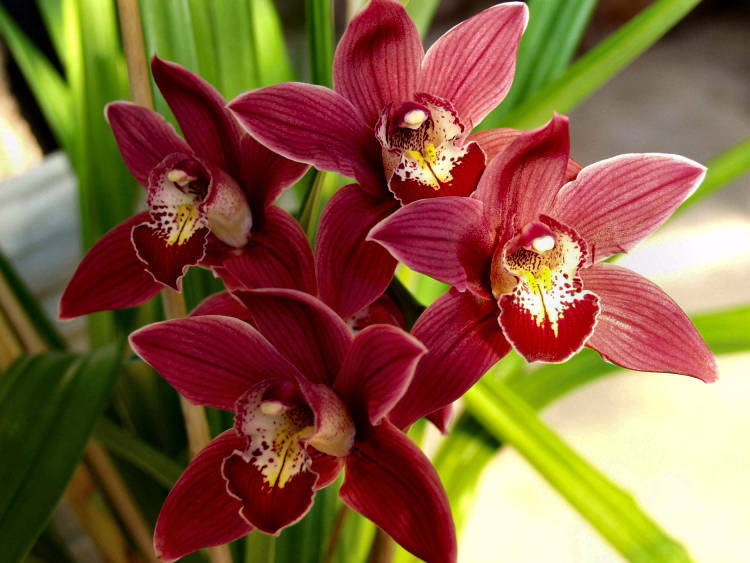 Cymbidiums are often tree dwelling, with thick water absorbing rots that help them survive. They should be planted in a coarse orchid mix making sure that the plant has plenty of drainage. Whilst we are already in the throes of winter, it is not too late to invest in one of these beauties and enjoy their large, bright blooms and lush foliage. 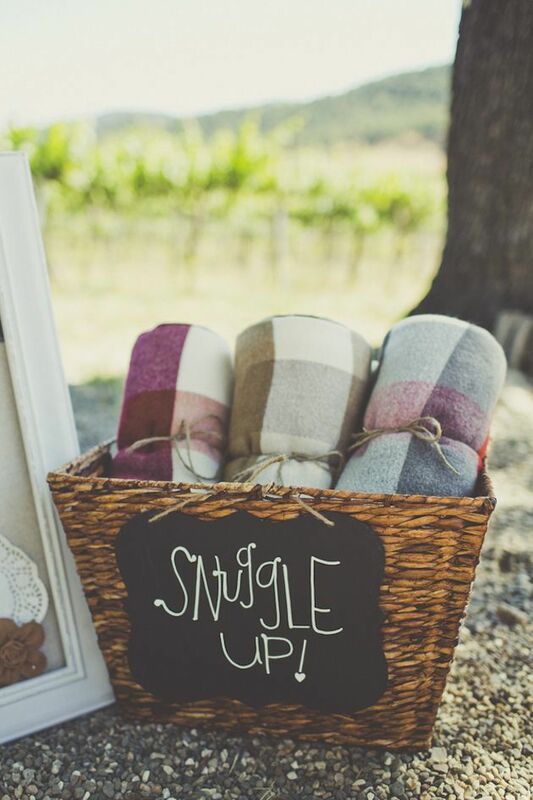 Whilst Spring is undoubtedly the most popular time to get married, each season has unique qualities on offer that may appeal to different couples for a variety of reasons. 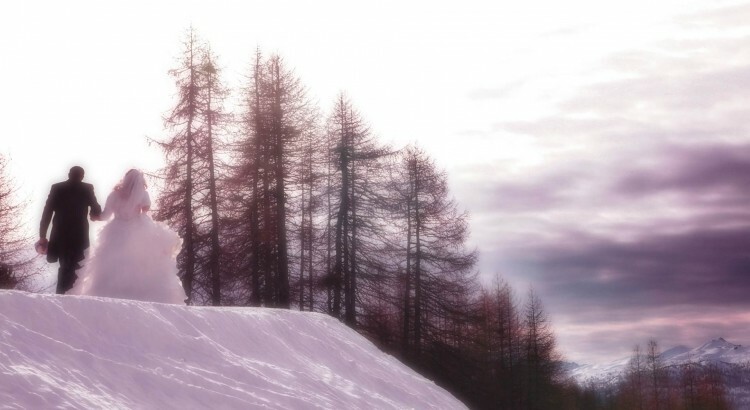 Aside from the temperature differences between months, the colder climate usually offers a larger choice between venues due to less bookings, as well as more flexible access, or even longer hire times. For us as creative professionals, it also means we get the opportunity to use a variety of products that are only available at this time of year. 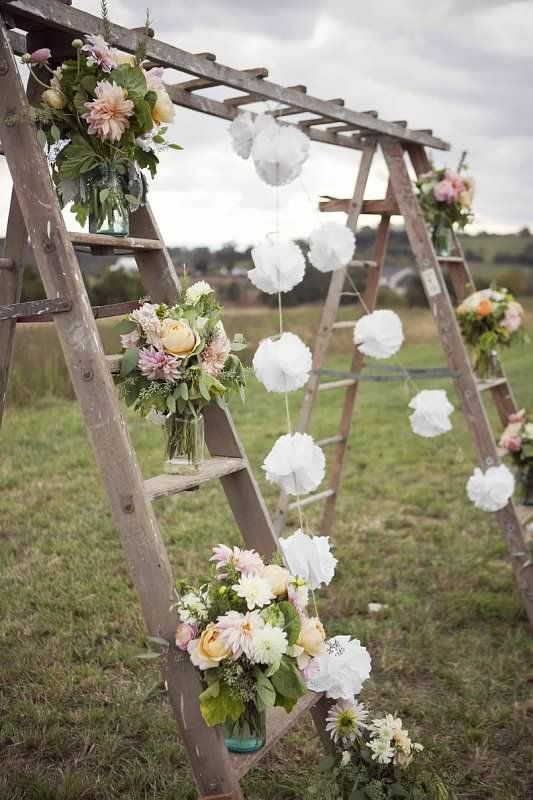 Using flowers that are specific to a season, rather than available throughout the entire year, means that each year, when those flowwers begin to appear again, you will be reminded of your special day. 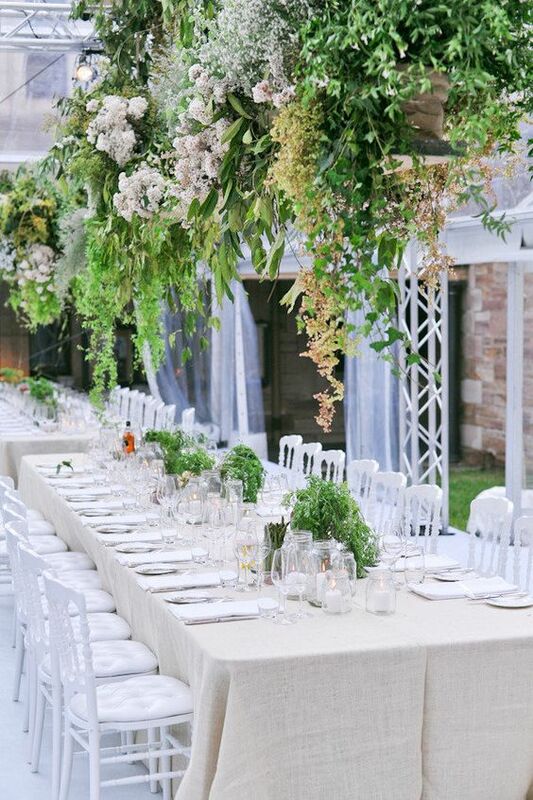 The Australian winter has an array of wonderful blooms available that can certainly make your wedding stunning. As an added bonus, many of the winter bulbs are also highly fragrant. 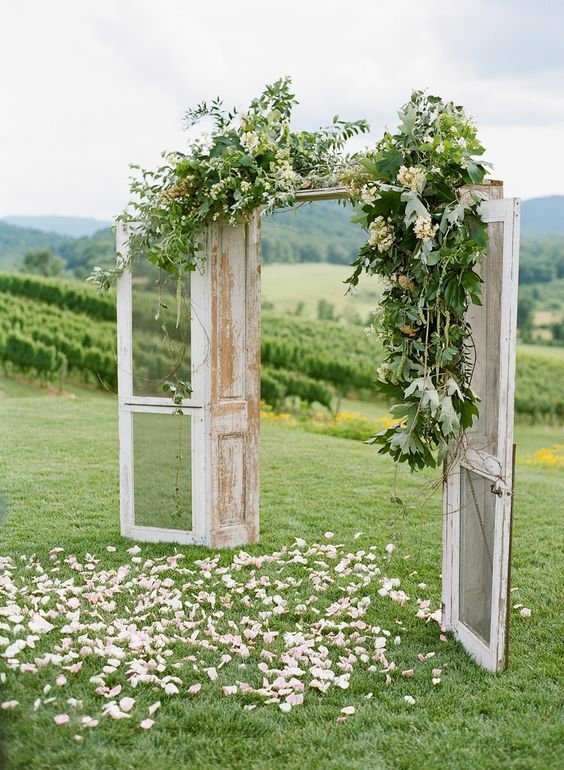 I’ve said it before, but I’ll say it again, fragrance has the amazing ability to instantly transport you to another time and place- and what a way to remember your wedding day! 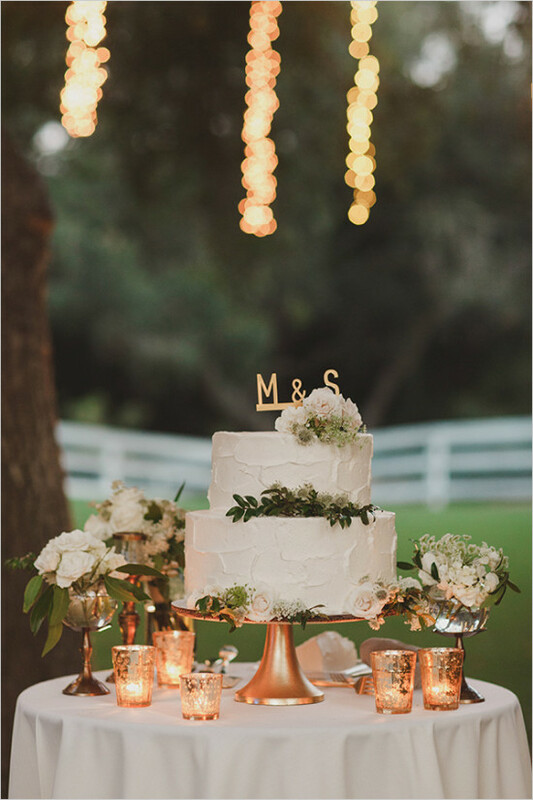 Winter weddings also lend themselves to warmth, fire, and candlelight, so you may choose to bring candles into your centrepiece design. 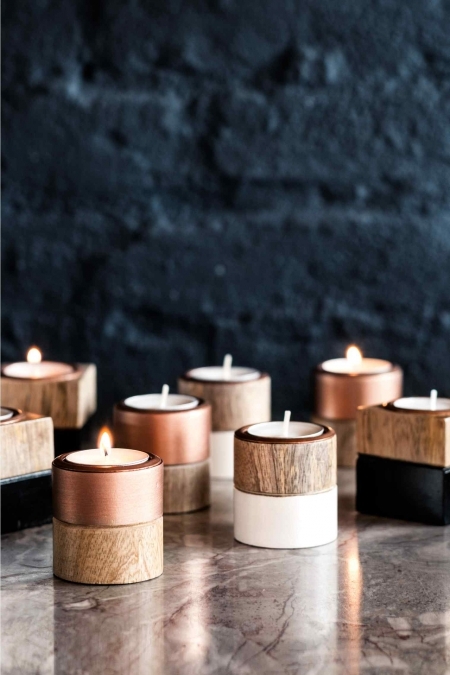 You could choose to do this in many ways; tealight votives have been around for years now and are certainly not specifically on trend, however you will notice that the details on them is evolving and many shapes, colours and styles are now at your disposal. Tealights will illuminate your room beautifully, adding a soft glow to the room, and added intimacy. 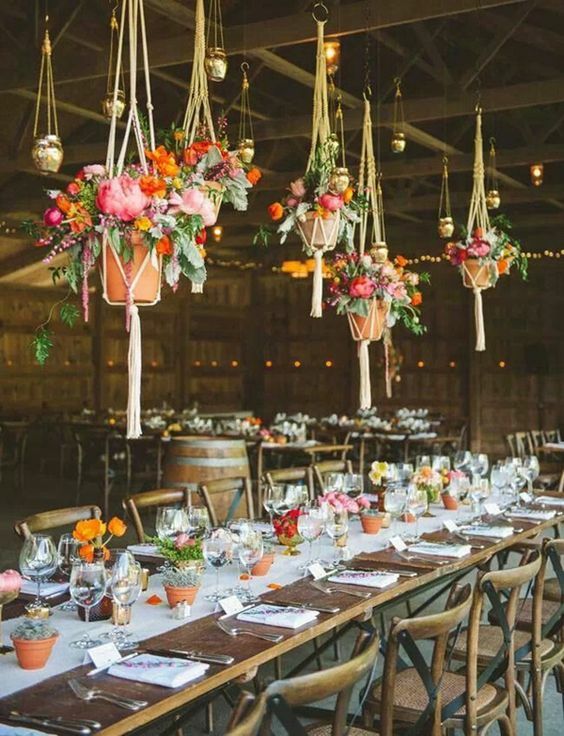 Certainly the colour tones you choose should also reflect the atmosphere you wish to create; warmer, richer hues will make the wedding feel more intimate and cosy. Think copper and rose gold highlights for a change from the standard silver details. 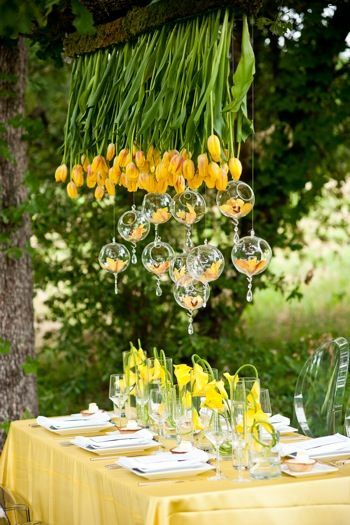 Alternatively you could utilise hanging tealight globes. They elevate the lighting and add a feeling of intrigue and magic to your room, especially if the overall lighting of the room is kept low. 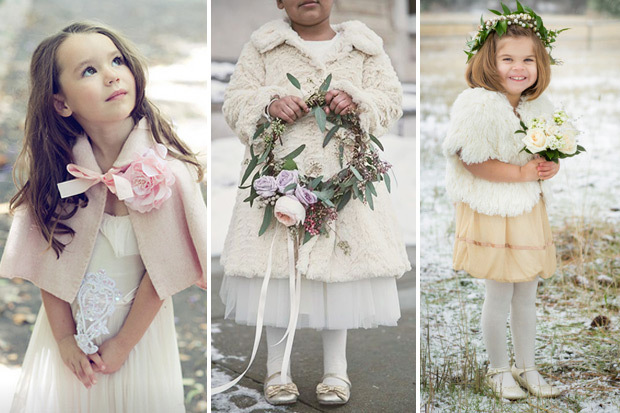 Winter weddings concentrate on texture; from the contrast in fabrics of the gowns and the fur/woolen shawls, perhaps you introduce vintage velvet blazers or earthy wooden elements like tree stumps. 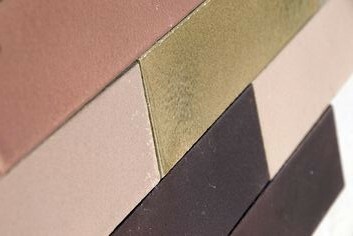 Colour schemes should be warm and rich; Try using pink with charcoal, rose gold and copper or Chocolate teamed with dusty blues, vanilla and navy blue. I think the key is teaming richer, darker elements with lighter tones to lift the mood and create contrast. 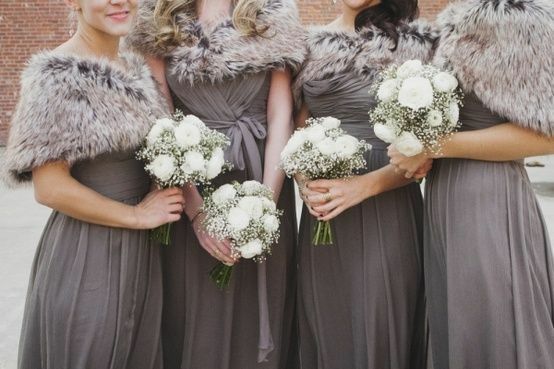 There is no reason why a mid Winter wedding need be cold and miserable. 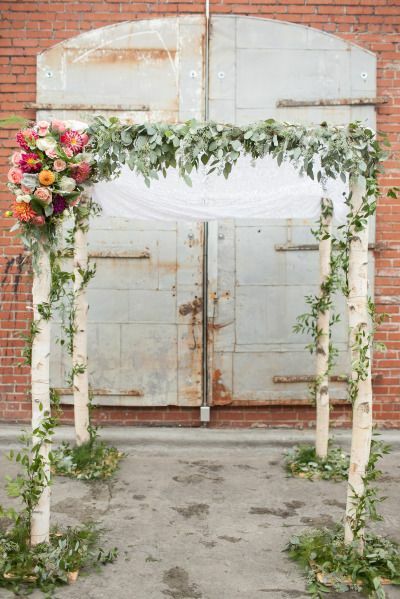 Choosing key elements like the venue, and the wardrobe are crucial in making sure everyone feels comfortable and warm, so be sure to keep that paramount in your planning. With the cold weather setting in, and days of rain keeping us locked inside, it is easy to succumb to the tastes of sweet sugary drinks, and heavy comfort foods. But rather than another mug of hot coffee with the obligatory Tim Tam Slam. Why not try your hand at some of your own home brews using one of nature’s precious gifts, flowers. Lavender contains polyphenols, a type of antioxidant linked in the prevention of heart disease, cancer, and osteoporosis. 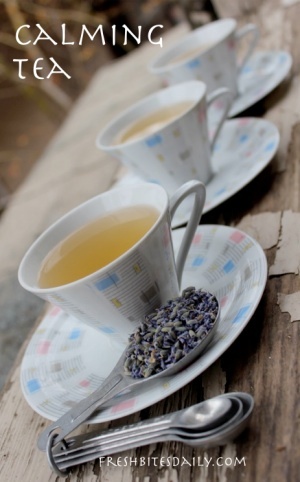 If it is steeped too long, Lavender can sometimes have a potent taste, so try not to leave it too long. As Lavender’s perfume (and taste) are so strong, it does tend to polarise people; you will find people either love it or hate it. 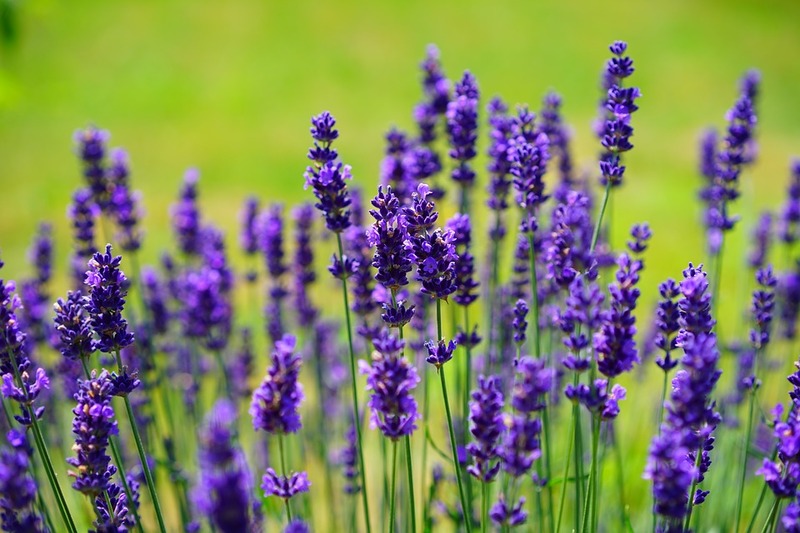 Two tablespoons fresh or dried lavender flowers. Pour boiling water over lemon balm and lavender (if you are using dried or fresh lavender). Cover and let steep for about five minutes. 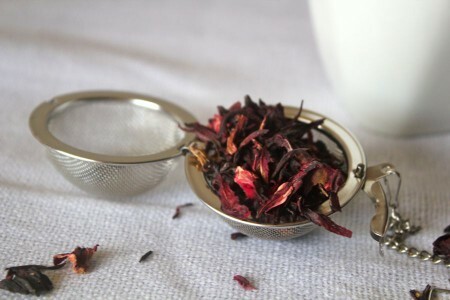 I found this interesting recipe for a Rosy Black Tea via Nourishing Simplicity, and I like it because I have always enjoyed the delicate flavour roses empart in food and beverages. 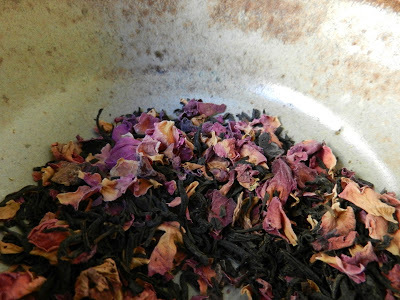 It is super easy as all it requires is 2 parts rose petals to one part black tea- how easy is that!? And while this tea is perfect on its own, try it with a little milk and honey to take it to a whole new level. 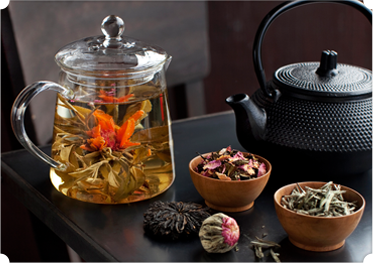 You can make this tea in any quantity you like, so they suggest using 1/4 cup as your measurement and go from there. As it isn’t heavy in ‘tea’ you can serve this to children, and it makes the perfect addition to any tea party. If you have a good quality fragrant organic rose, you get that rose taste exactly as you smell it PLUS roses have plenty of vitamin C and can help relieve water retention and other forms of congestion in the digestive tract. Place the rose petals and black tea in a glass jar. For a single serving place one teaspoon of tea in a strainer. Put the strainer in your favorite mug and pour boiling water over the tea. Let steep for no more than 5 minutes. Remove the tea and enjoy. Now with the cold weather upon us, it is likely that you or someone you know currently has a cold or flu So why not try you hand at this natural cold remedy. It is always important to keep your fluids up when you are feeling under the weather, so any other benefits this delight bestows on you is a bonus! Place a pinch of each ingredient into teapot. Boil water and add. Allow to steep 8-10 minutes. 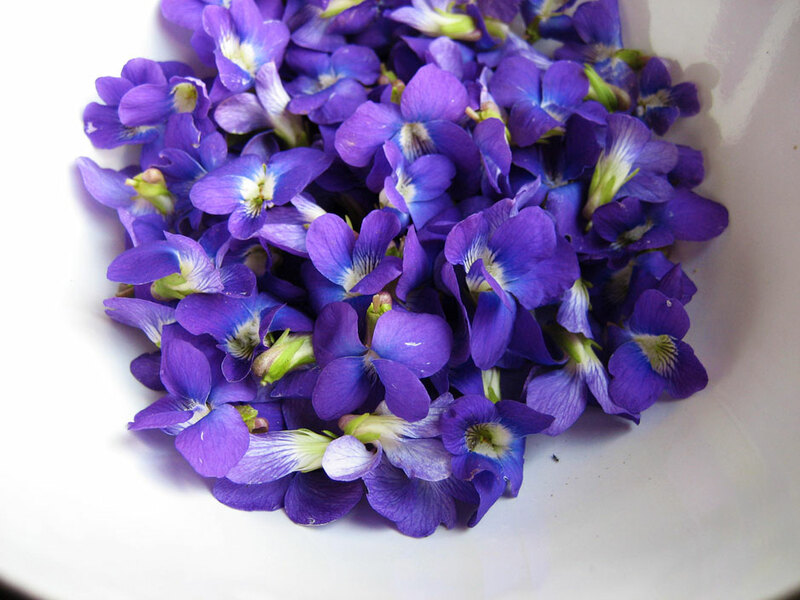 Have any other flowers you like to use in cooking or beverage production? Drop us a line and let us know some of your personal favourites, we would love to hear from you. Cyclamen plants are an oldie but a goodie. Still to this day, customers regularly request them, they never last long in store, because they make a great houseplant and a simple gift idea! But sometimes, sadly, we are giving the poor plants a death sentence when the correct plant care is not understood. 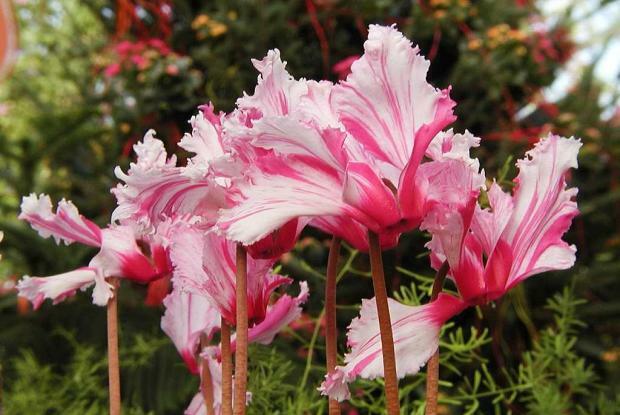 Cyclamens are classified as a tuber (similar to a potato) from which the flowers and roots grow, and they are valued for their frilly flowers and gorgeous variable leaves. The tuber may produce roots from the top, sides, or bottom, depending on the species. Generally in most of their species, the leaves appear in Autumn, grow through the Winter, and die in Spring, remaining dormant through Summer. Flowering time can be any month of the year, depending on the species. 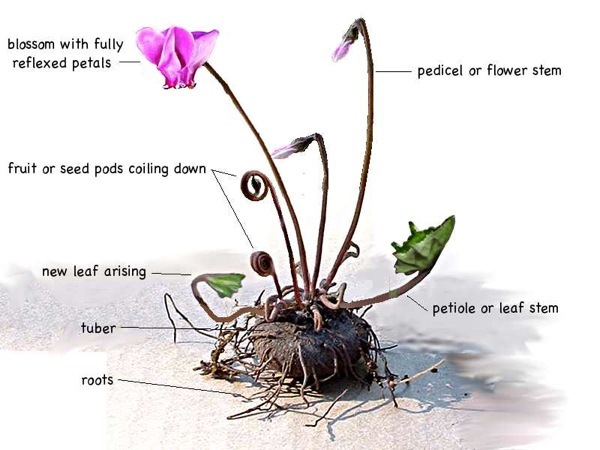 Cyclamen hederifolium and Cyclamen purpurascens bloom in summer and autumn, Cyclamen persicum and coum bloom in winter, and Cyclamen repandum blooms in spring. The florist’s Cyclamens usually start appearing around or just before Mother’s Day when the temperatures begin to drop. 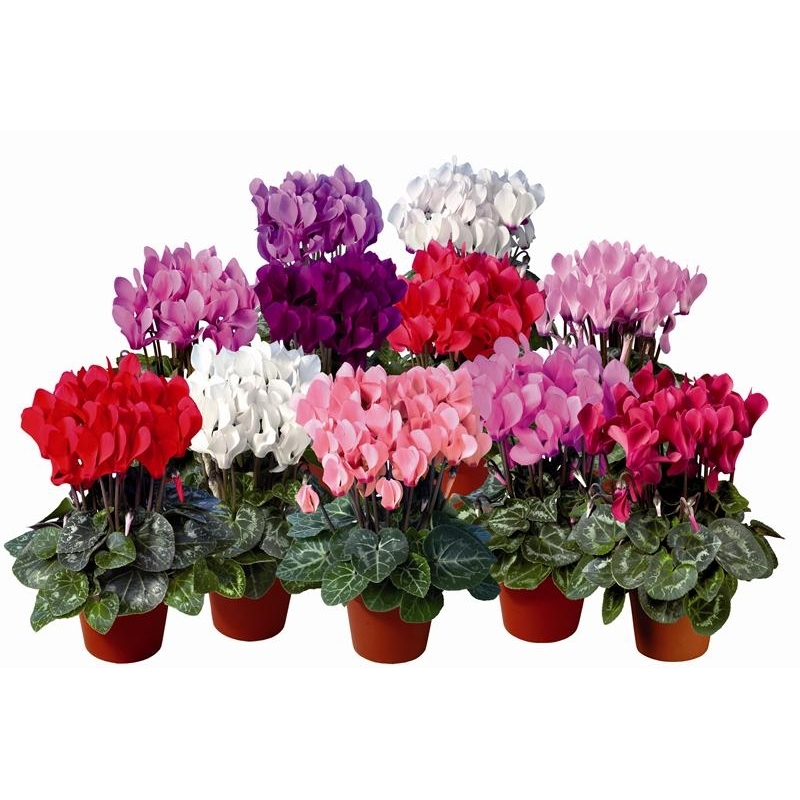 Generally the species that florists sell is Cyclamen Persicum, which is frost tender. They should be kept below 20 °C with night time temperatures preferably between 6.5 °C to 15 °C. When cyclamen are not kept at the correct temperature, your plant will die slowly. Cyclamens grow in cool, humid environments in nature, so whilst they are readily available and flourish through the winter months, one of the biggest mistakes people make, is keeping their plant in their heated homes. Heaters keep the environment comfortable for us, but far too hot for your plants whilst also severely dehydrating them. If temperatures are too high, the plant will begin to yellow and the flowers will die, fast. When plants are not kept at the right temperature, you can also cause the plant to become dormant, which looks alot like it has died. Just as important as correct temperature, is adequate (but not over) watering. Cyclamens can be sensitive to both over and under watering. The easiest way to ascertain whether your plant requires watering is to perform the ‘touch test’- simply placing your fingers onto the soil underneath the leaves and pushing downward to determine how much moisture is in the soil. If the plant soil feels dry, you should water it. 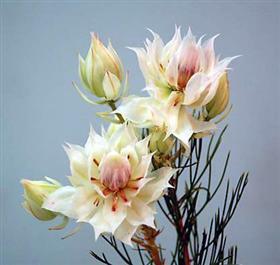 It is important that the plant is not left in this dry state for so long that the leeaves and flowers begin to droop. Cyclamens generally like to be watered from the bottom, to avoid getting the leaves and stems wet, which causes them to rot. Make sure that the plant is able to adequately drain after watering it. 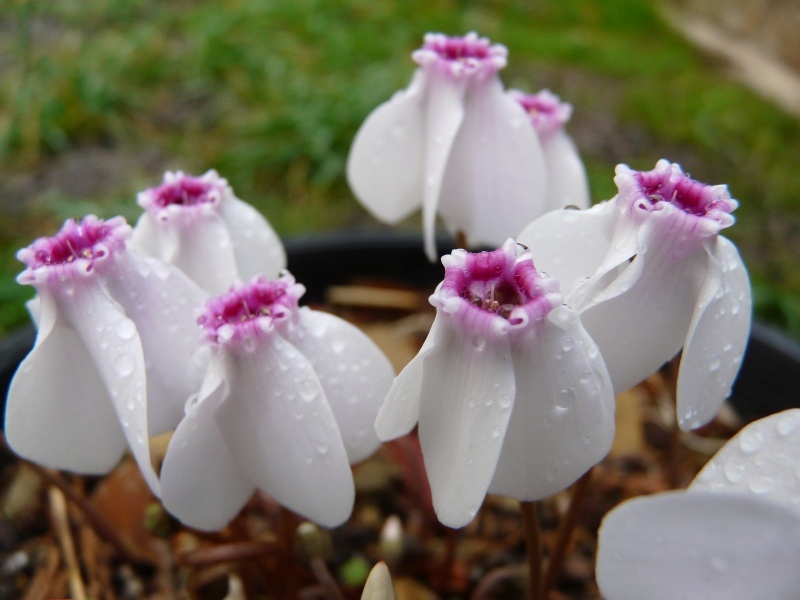 Once the cyclamen has finished flowering, it will go into a dormant state. In this state, is looks very much like it is dying, as the leaves turn yellow and then fall off. It is just sleeping. 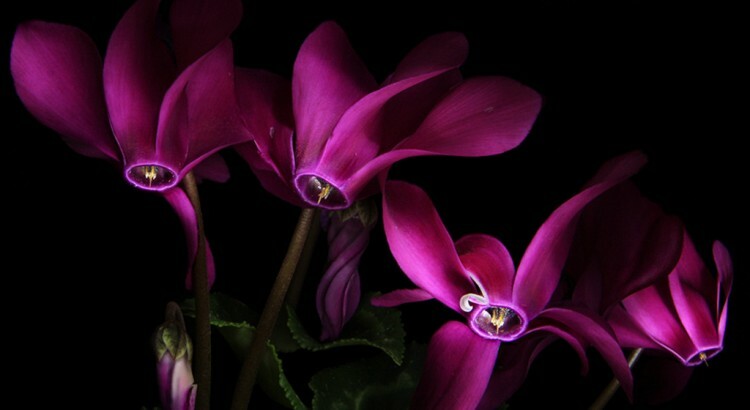 If you continue to care for your cyclamen throughout it’s dormant period, it will rebloom in a few months. Stop watering the plant once you notice that the leaves are beginning to die. The plant should be kept in a a cool, dark position, and you should remove any dead foliage. Let it sit for approximately two months. 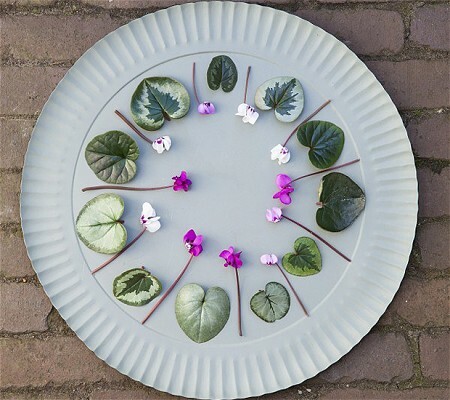 Once you see some leaf growth, you can start to water the plant again, resume normal cyclamen plant care, and bring it out into a brighter position. It should rebloom shortly. Cyclamens are available in an array of amazing colours, and we have often have them in store, call us on 02 9871 1666 to see if they have come in from market today! Weddings are beautiful. The whole idea of marriage is inspiring, and idealistic, and often, even the simplest of affairs can hold it’s ‘audience’ captive, simply as a result of the genuine love on display and the conviction in which the vows are spoken. 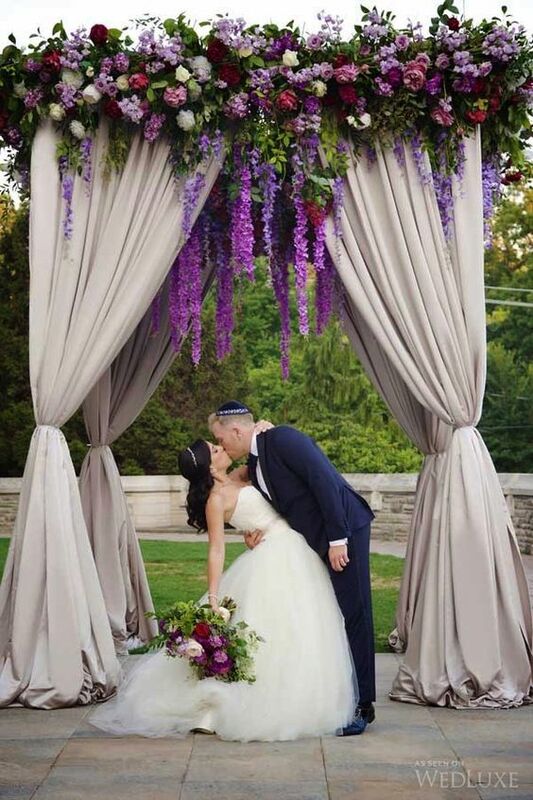 But all that aside, weddings can be visually beautiful affairs as a result of talented and creative wedding professionals and open minded, inspired couples who want to make there day one of a kind in more ways than one. These days the sky is the limit- quite literally. Venues are designed taller, bigger, better. Hiring companies offer a variety of structures that can be utilised to create intimate ‘capsules’ in which the whole scene can take place. 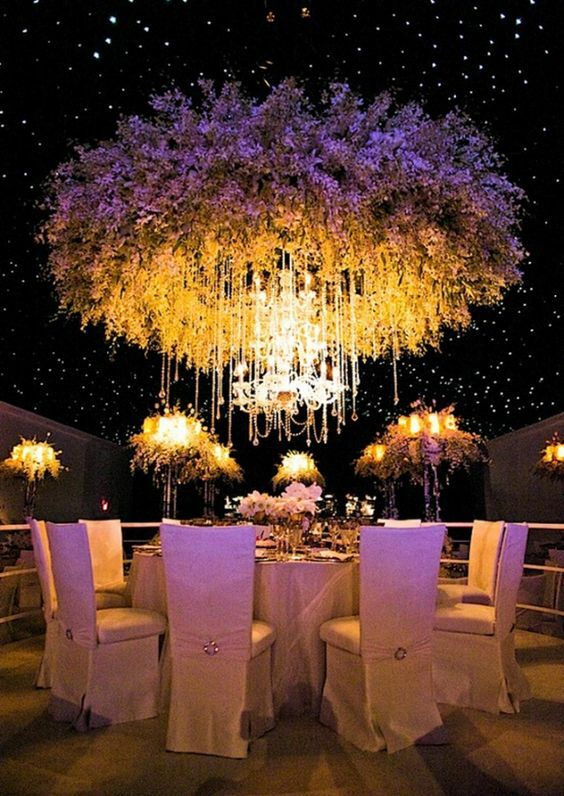 Really the only limitations to the visual effect you create is the capabilities of your suppliers…..and your budget. 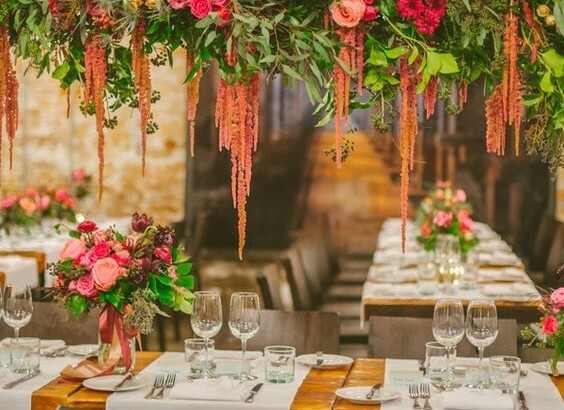 The floral fantasy wedding of just a few years ago is becoming more commonplace, with many couples choosing full floral garlands cascading along the length of their bridal table (and above!) rather than a series of smaller arrangements along the edge. 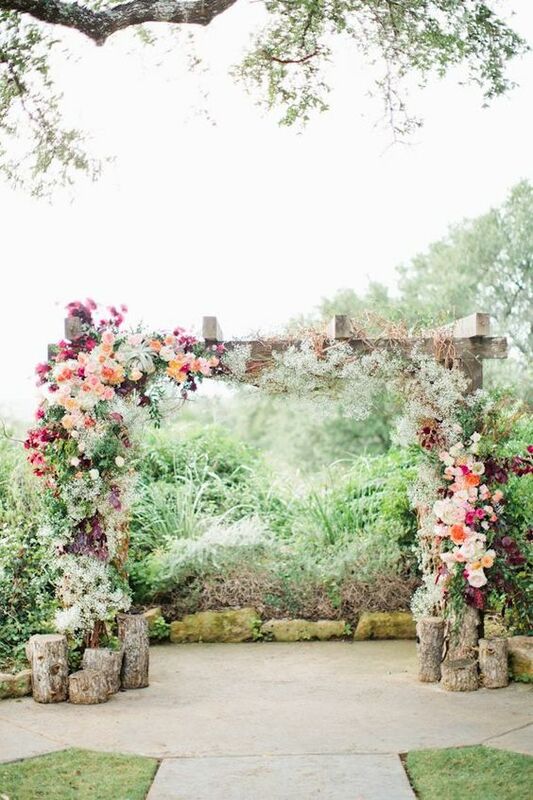 Similarly, outdoor ceremonies are being favoured with gorgeous floral archways, gazebos or chuppahs becoming centrestage. One benefit of this style of decoration is that it creates a grand appearance that can fill what would ordinarily be an empty space. 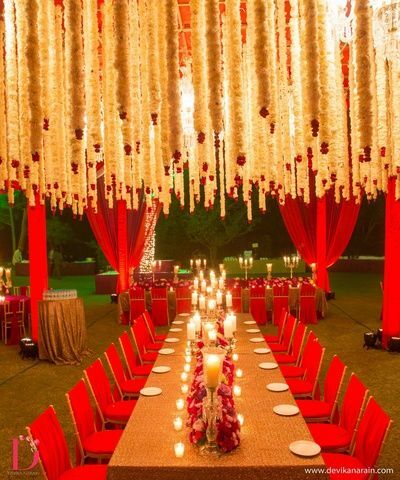 It provides a more modern option to the twin pillars and alter style arrangements that have been favoured in the past to create parameters for the ceremony. 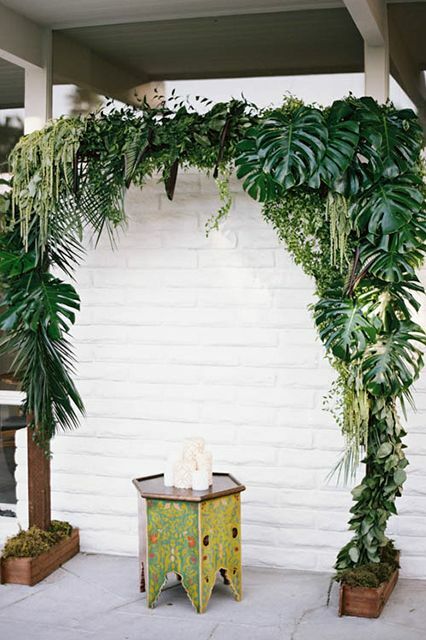 This may or may not appeal depending on the location you choose; iconic destinations that you have chosen to show off to international guests may not require this sort of decoration, however in some ways, even a simple ‘framework’ can be utilised onsite to create an intimate focal, especially for photos. 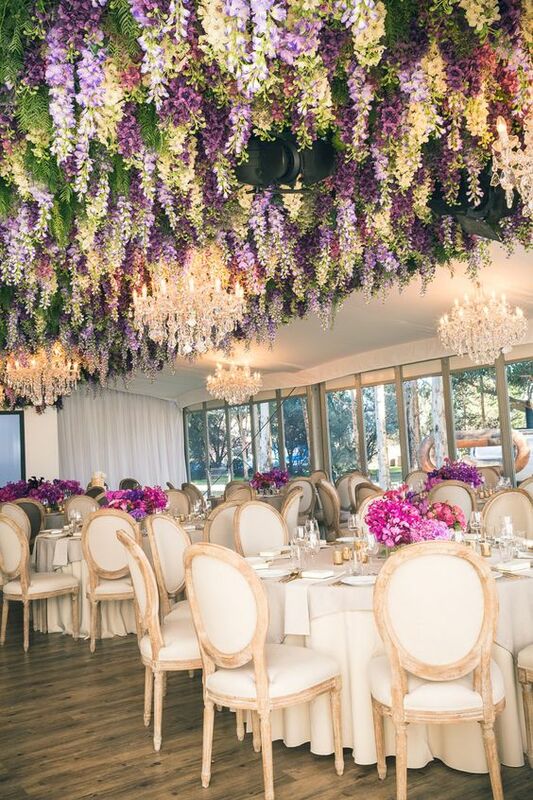 At the reception venue in particular, this style creates a feeling of decadence and opulence. 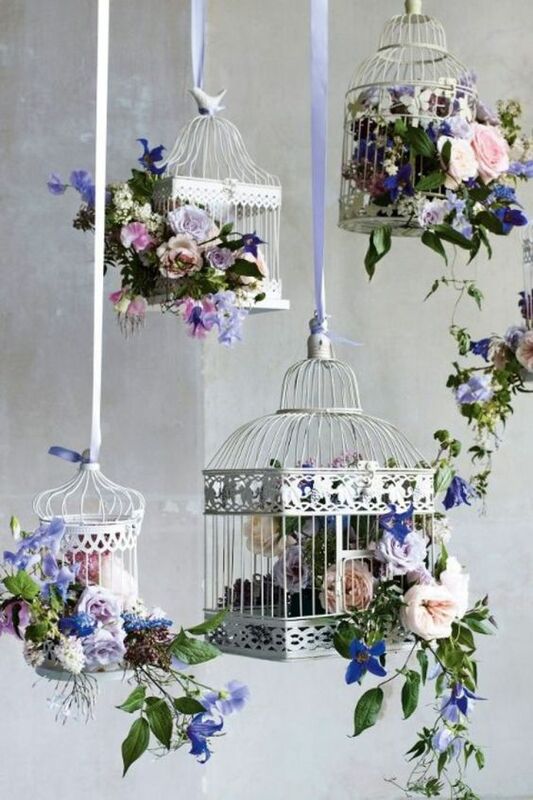 With this style of decoration, you can expect a big price tag. Structures may need to be created, rigging experts may need to be consulted or on site for installation depending on the size, and the team required for ‘bump in’ and ‘bump out’ may need to be two, or three times the size normally required on site to get the job done in what are usually very tight time frames. It is important to be realistic about the cost and not attempt to grind your supplier down on price as in the end, it will be you who loses out. These big and impressive concepts require a lot of work, man hours and a lot of talented people. If cost is your first priority, I would suggest this is perhaps not the best option for you. 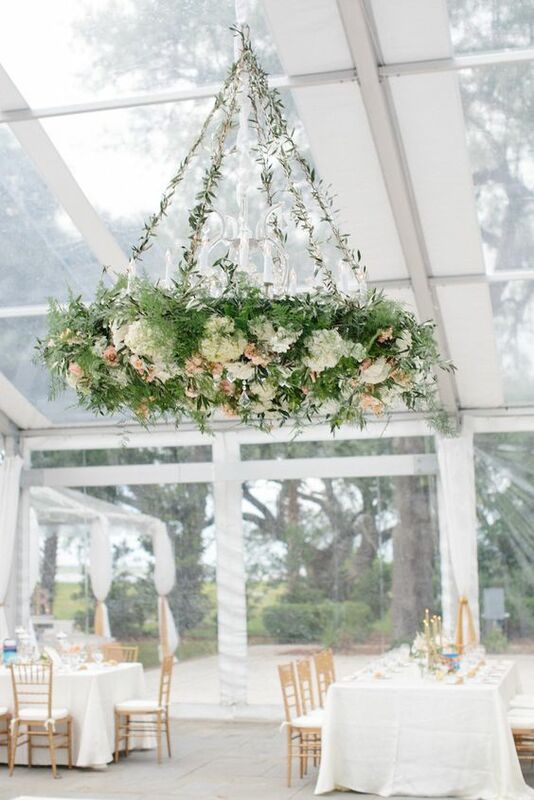 However, if your heart is set on having flowers that are the height of fashion, and give you the feeling that the heavens are opening up for you, check out some of the hanging florals we have found to get you inspired.